All the gold is buried here. Typing your schedule into a calendar is a drag. Save time by doing this. A new report to help you management your equipment costs. What Does 900+ Matches Look Like in Takedown Reports? If you've wondered what lots of matches scored in Takedown would look like, here's your chance! Below are links to various Takedown reports for 900+ high school matches scored with the app over two and a half seasons. Takedown created these reports in less than five minutes and without an Internet connection. All your stats, all the time, no waiting. Takedown not only makes it easy to score scholastic wrestling matches, the app also reveals team and individual performance metrics that can not easily (if at all) gleaned from paper score books. scorebook as the official record of a dual meet. This signature meets the requirements of the NFHS Wrestling Rulebook. Congrats to Mike on achieving a wrestling first! Additionally, in the Reports section, tapping the sharing arrow in the upper right hand corner offers some new choices including "Open in...". With this capability, the Scorebook report can be opened in a variety of PDF-compatible apps, many of which support document signing. From this list, I choose Adobe Reader. It has a freehand drawing tool which is perfect for adding a signature to a PDF document. Here are the steps to add the signature. Remember to "Save" in the upper right corner. That's it, you're official! 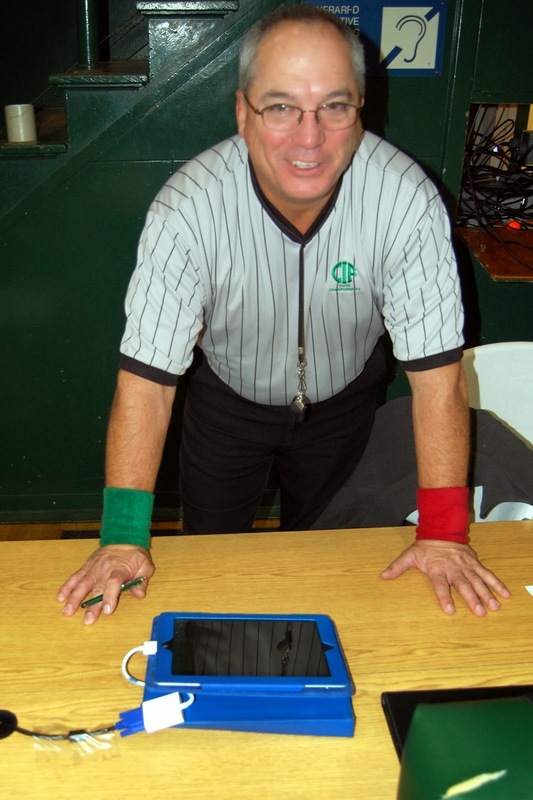 From here you can use Adobe Reader to organize, print and email you Scorebooks. 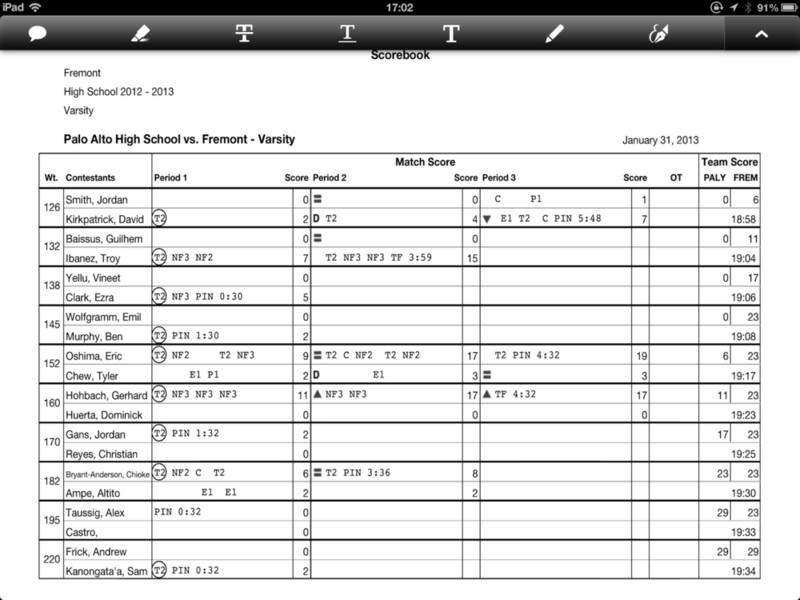 The app Notability can also be used to sign and organize your Scorebooks. From our perspective, Notability has better freehand drawing and sharing features. You'll need to decide what works for you. So, if you ever wanted to go "officially" paperless, we have your back with Release 1.4. Start using Takedown today and say goodbye to your paper scorebooks! We have added a new report in Takedown Release 1.1 that is the first of many statistics-oriented reports that we have in plan : the Short Time Scoring Report. Some background - one of the reasons we created Takedown was to uncover the coaching insights that are hidden inside match scoring books. Coaches are always wondering "how does my wrestler do in short time?" This is what the Short Time Report is intended to answer. This new report can be found in the Reports section of the app. Takedown allows you to set a short time value of 5, 10, 15 or 20 seconds and reports by wrestler the number of points scored and conceded within that time-frame. It also provides a ratio - the Average Point Differential (APD)- that allows you to quickly evaluate a wrestler's short time performance. APD is simply the difference of points scored and conceded divided by the total number of periods. If the APDvalue is positive, then your wrestler is scoring more points than conceded. If the APD is negative then the opposite would be true. As a coach that's what you want to know. The accuracy of the Short Time Report depends on your having scored the match live. If the match has been transcribed then the timings are likely to be inaccurate. Takedown uses some common sense rules to guess at whether the match was scored live or transcribed. If Takedown suspects that the match is being transcribed it will ask you if this is true. If your reply is yes, then Takedown will not include this match in its Short Time Scoring computation for that wrestler. You can later change this status. 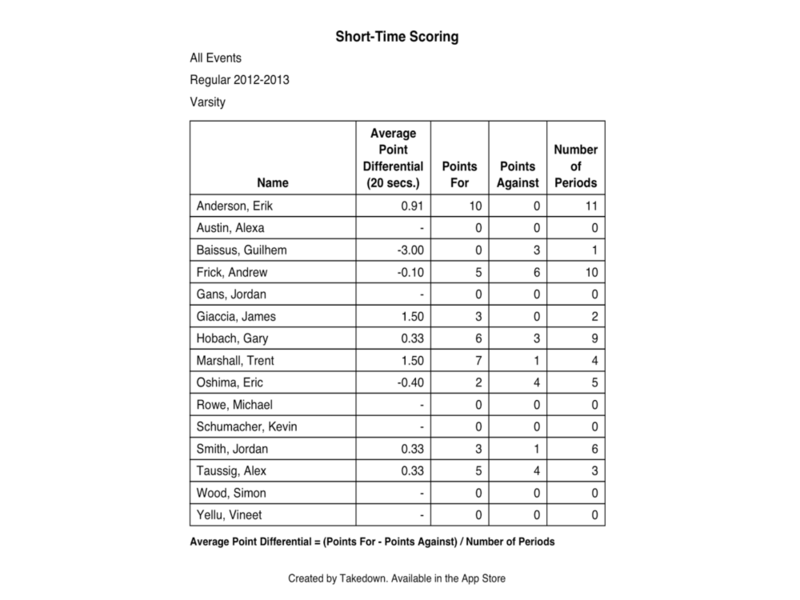 Check out the Short Time Scoring report in the current release, available on the App Store.